The PWM couplings are developed to meet General applications, that require extra reliabilty and a “fuse”system that cease the torque transmission when diaphragms fail. The PWM couplings are not lubricated by the fact that they are Diaphragm, are exempt from the need for adjustment, rebalancing, cleaning and replacement parts other than fatigue or overload operation. Because their dimensional accuracies the PWM engagements reach high speeds with optimum levels of balance, which may be increased when necessary, within the parameters of ISO 1940 or API standards. For these cases, will be issued Balancing Certificate. 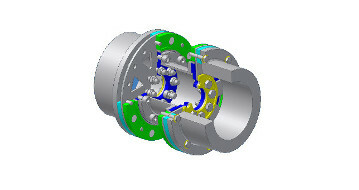 All line couplings PWM are provided with Diaphragm in stainless steel and other parts in carbon or Stainless Steel.